Essentially, a mode is a scale that doesn’t start on its root note. For example, the Lydian mode starts on the fourth note of the major scale, so C major (C D E F G A B) gives you F Lydian (F G A B C D E). What’s the difference? Well, despite sharing the same notes as the major scale, modes have different intervals, giving each mode its own special sound. The vital interval in the Lydian mode is the #4th. In the C major scale the root (C) and 4th (F) are five semitones apart; in the Lydian mode the root and #4th are six semitones apart. C major and F Lydian are very similar, sharing all the same notes and just a different 4th interval. The striking sound of the #4th against the root note gives the Lydian mode its leftfield vibe. Try playing F and B notes on your guitar to hear the clashing sound. Here we’re playing the C major and F Lydian scales. Play through the shapes and notice how F becomes your new root note once you’re playing F Lydian. 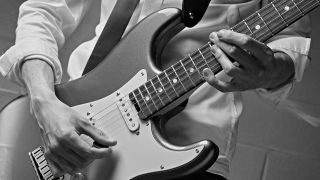 The notes of an F chord are F, A and C – all of which appear in F Lydian (F G A B C D E) so the chord and the mode are guaranteed to sound good when played together. However, to bring out the Lydian flavour you need a #4 interval such as Fmaj7#11, Fsus#4 or Fadd#11. Remember, a #11 is the same as a #4, just an octave higher. This simple arpeggio is inspired by instrumental guitar legend Joe Satriani, who's famed for his love of the Lydian mode. The 12th fret B note is the all-important #4th interval. Moving on to a lead guitar lick, again inspired by Satch, you’ll see that the crucial #4th (12th fret, second string) only occurs briefly: twice in bar 1 and once in bar 2. You can probably hear more of the Lydian flavour here, compared with bars 3 and 4. Still, the arpeggio is playing in the backing music, so it still sounds Lydian throughout.